Ghana has hosted its second Training-of-Trainers’ course on “Everything you need to know about sweetpotato.” The training was held in the Kwame Nkrumah University of Science and Technology (KNUST), Kumasi-Ghana and Centre for Scientific and Industrial Research-Crops Research Institute (CSIR-CRI), Fumesua-Ghana from the 22nd May to 2nd June, 2017. The course was offered by KNUST in partnership with CSIR-CRI and the International Potato Centre (CIP)-Ghana. 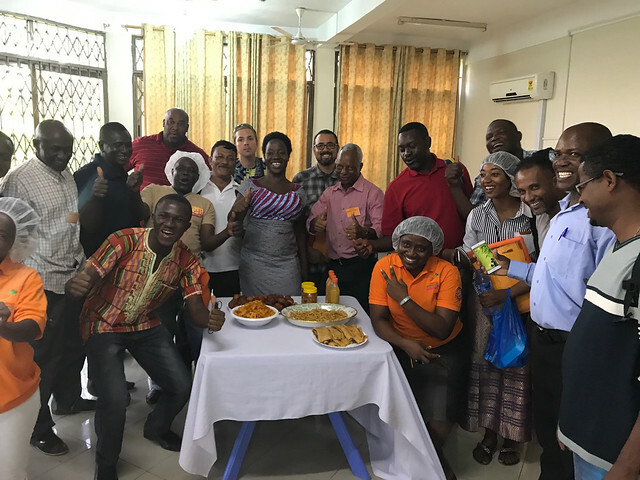 The overall objective of the training was to build the capacity of national implementing agencies in Ghana and the West African region to drive and promote uptake of Orange-fleshed sweetpotato (OFSP). However, this year, the course attracted participants from all over the world. An 8-member committee, chaired by Prof. I. Oduro (Provost, College of Science, KNUST) was formed to plan and implement the training course. The Committee selected 10 highly qualified and experienced facilitators who had facilitated various courses during the first course that had been held in Ghana between 1st and 12th February, 2016. Prior to this training, they had gone through a 5-day pre-training course. This year, a one-day refresher pre-training was organized for the facilitators. The training course was attended by 18 participants from across Africa; Kenya, Ethiopia, Burkina Faso, Zambia, Tanzania, Cameroon, Gambia, Guinea and Ghana. There were also some participants from Nepal and the United States of America. Most participants came from Peace Corps while the others were from governmental and non-governmental institutions. All the courses the participants were taken through were full of demonstrations and practical sessions with some lecture periods and lots of discussions. Participants shared ideas and experiences that reflected their home countries. By so doing, both participants and facilitators learnt a lot. In addition to the practical sessions, there was field work on harvesting, pests and diseases, net tunnel construction and cooking of various sweetpotato dishes including traditional OFSP foods, among others. Participants were very happy with the relevant and practical course content. At the end of the course, they demonstrated that they had learned a lot and were confident to teach others. They also added that they could not wait to get back home to start their part of training. In order to determine whether participants had indeed acquired some knowledge from the course, pre- and post-course assessments were conducted. The assessments indicated that participants had gained an average of 29% increase in their knowledge on everything they needed to know about sweetpotato. The maximum improvement in knowledge was 49% while the least was 11%. All the 18 participants signed an action plan to train others once they got back home. Their action plans provided information such as the purpose for the training, target audience, tentative dates, challenges to address and estimated budget. They shared their action plans with their fellow participants to get more ideas and modify them if need be. Their target audience were governmental and non-governmental organizations including Agricultural Extension Officers, staff from their institutes, food security coordinators, farmers, and other stakeholders. All action plans identified challenges along the OFSP value chain and they seemed poised to address those challenges. A social media platform (Whatsapp) was created to keep all participants in touch, share ideas and enable facilitators to provide support when participants need them. At the end of the course, each participant was also given a USB drive containing all course materials and training resources. The 10-day Training-of-Trainers’ course was designed to provide participants with the skills and knowledge to train others on everything there is to know about sweetpotato. It was adapted for Ghana from an original course, “Everything you ever wanted to know about sweetpotato” developed and implemented by the International Potato Centre (CIP) under the “Reaching Agents of Change” project. Check out more photos from the ToT training on Flickr!